All righty! I've been back from vacation for about 15 minutes and I gotta put my kid (and myself) to bed. 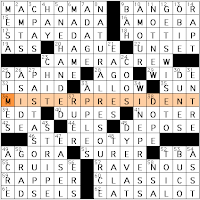 Wow, it would've been clever of me to line up a guest blogger for the Saturday puzzles. Speaking of clever and guest bloggers, let's hear it for the whole team: PuzzleGirl (who volunteered to take on three whole days but then sagely farmed out some of the work to the fellas). Janie, who isn't a guest blogger but regularly keeps the show going here on the CrosSynergy front. Joon, who covers the Matt Gaffney puzzle for us each week and chipped in on the Friday action. Crosscan, or Jeffrey Krasnick, who guested earlier in the week and joined the Friday puzzle party too. Plus Jordan Chodorow and Dan Naddor a few days back. Dang, that's a lot of people. What the heck am I doing blogging about so dang many puzzles in a single day? I sure do love Karen's grids! How about the crazy 2x2 square of Zs in the southwest quadrant? There's VERRAZZANO, [Explorer of North America's eastern coast in 1524]. The double-Z spelling looked funny to me and indeed, the Verrazano-Narrows Bridge drops one Z. The JAZZ AGE is the non-geographic ["The Great Gatsby" setting]. And the delightful NUZZLES/PUZZLES cuddle rounds out the Z-square. Tricky spots: I tried RETESTS for [Second chances for students], but MAKEUPS is definitely a better answer. ULANUDE is or was the [Capital of the Buryat Republic]. Someone wanna Google that for us and tell us where this is? Middle East? Central Asia? KLEIN is the [German mathematician who lent his name to a "bottle"] and this rang no bell at all for me. IRELAND is clued toughly as [Home of the Knockmealdown Mountains]. [Cousin of an Omaha] could be any 5-letter Great Plains tribe, I reckon; turns out to be PONCA. I also slowed myself down by misremembering a 3-letter abbreviation; the [W.W. I military group] is the AEF, or Allied Expeditionary Force (if memory serves), but I started with AEC (Atomic Energy Commission!) and had a heckuva time getting FRANZ KAFKA to come out of hiding. That's all the time we have tonight. See you in the morning! 17A. NAPKIN RING [Place setting piece]. 26A. HAWAIIAN PUNCH [Beverage with a Fruit Juicy Red flavor]. And how about the knock-out that this classic commercial delivers? 44A. STEAMER TRUNKS [Luggage for seafarers]. This looks to be first-time fill; the other three, CS-firsts. 56A. DIVING BELL [Device used in marine salvage]. You all know about the bell that marks the beginning and ends of the rounds in a match, but forgive my digression to say something about the diving bell. I'm currently reading The Terrible Hours, Peter Maas's harrowing account of the rescue in 1939 of the crew of the submarine Squalus, which had sunk off the coast of New Hampshire. How was it accomplished? Yep. With a diving bell and Momsen lungs. This was the U.S. Navy's first successful submariner rescue and a most dramatic one at that. Thanks to Momsen's ingenuity and foresight and tenacity, however, the Navy was genuinely prepared to respond to this disaster—and did. Now this may not be the most ambitious theme in the world, but like most of the CS puzzles most of the time (and why I tend to enjoy them so much [yes, even when I appear to be HARPing on the question of repeated themes and fill...]), it's solid and it's really well-made. How so, besides in the "fresh-fill" department? See PUP TENT and TEEPEES? Not only are they both found on campgrounds, but they're found in symmetrical opposition in the grid. That's nice. Ditto the placement of SPELL CHECK and APOSTROPHE—and the connection that can be drawn between those two words. The former is used to [Scan for typos], and many's the time it will catch misplaced (or missing) [Contraction punctuation]. All four words look to be CS first-timers (but why do I think SPELL CHECK made an appearance a few weeks ago?). 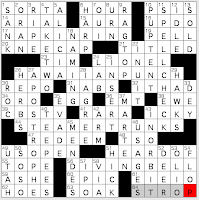 My full writeup is at L.A. Crossword Confidential. I didn't time myself on this one, but I hit zero roadblocks so I suspect this is one of the easiest Stumpers this year. Did you have the same experience? 17A. [Inspiration for "The Persistence of Memory"] is CAMEMBERT CHEESE. I did not know that! Fun trivia. 46A. [Venomous caterpillars] are ASPS? Huh. Go figure. 59A. The JEFFERSON NICKEL is clued [Its front got a makeover in '06]. We didn't make it over to the Jefferson Memorial or the Lincoln Memorial, even though my neighbor Susan exhorted us to. Yo, D.C.: Extend your train tunnels out that way, would you, please? I was not in a long-walk mood. 1D. [Clay eater] is a MACAW. [Paste eater] would be THAT KID YOU DIDN'T LIKE IN KINDERGARTEN. 2D. [One of about 3.4 million Asians] clues an OMANI. I know the Middle East is technically in Asia, but...nobody much thinks of it that way. 30D. [Slipper?] clues BANANA SKIN. I asked my husband if he's ever heard anyone call a banana peel a banana skin. "My mother," he said. English isn't her first language. I say BANANA SKIN is not quite "in the language." 47D. I just now understand why [Travels tirelessly] clues SLEDS. Sledding is traveling via a vehicle without tires.